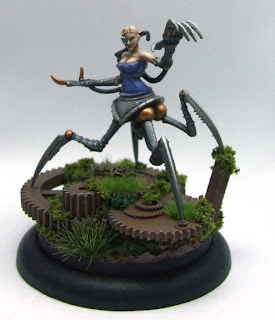 My last post looking at the models I'm using at the moment, Molemen, went down rather well so I thought I'd follow up with another look at a model that's spending a lot of time on my gaming table; Miss Step. 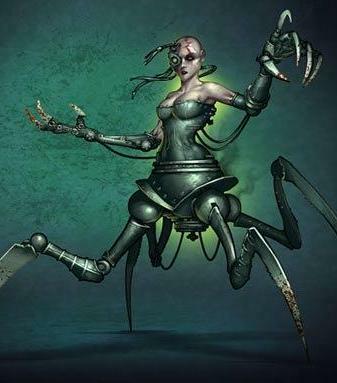 While she's this years GenCon exclusive model rules wise she's a carbon copy of Howard Langston, aka the Steamborg Executioner. Therefore the model is accessible to all, just in a less pretty package. Miss Step doesn't come cheap at any game size, costing 12ss she takes up almost a quarter of your (50sss) crew. Any model approaching that cost needs to be worth their wight in gold, especially as the lovely lady isn't a henchman, and therefore has no access to soulstones. So why take her out for the evening? Well firstly she's a powerful hitting peace; Ml7 with a weak damage of four and an after damaging head shot trigger means there are few things in the game she can't kill. especially activating late in the turn where even the risk of a moderate Ram or two off the top may be enough to ruin someone's day. Just as importantly she's light on her feet, with a five inch walk and Nimble to boot she can certainly dance, even with two left feet. This combined with a melee range of two this girl can deliver significant punishment at extreme range, three attacks at 7" or two at 13" is nothing to be sniffed at. If you're not scared by this combo of movement and damage you should be. Of coarse no model can excel in; damage, movement and defense so our Miss Step is a delicate flower. While her defense wounds and armor are fine they're nothing to write home about on a 12ss model. Once engaged with the enemy she needs to seal the deal very quickly or she'll fold. That said if you're looking for tanks the Arcanists have plenty of those already which is why she stands out from the crowd. The final trick up her sleeve is her (1) Steam Cloud ability, which puts up a 4" aura of soft cover around her. This makes it more likely she can make it over the board to engage the enemy and helps her crew out against more ranged focused opposition. Firstly in the center she's great standing just behind the lines, where her 7" threat range can really be brought to bare. It's tough to attack into a space fearing the counter attack from our girl. This is also where she can get the most support from the rest of the crew, helping to protect her and let her choose her own fights more effectively. Her steam cloud is also most useful here, protecting the body of the crew from ranged attacks. Alternatively she can more or less hold a flank where needed. In a recent game of Reconnoiter a large building in the middle of the board basically forced me to divide my crew in two. I sent Miss Step up the left flank with my molemen leaving Dr Ramos to square off vs my opponents master on the right flank. My opponent found Miss Step was too mobile to slip past and too dangerous to risk exposing anything to. Her threat range meaning he had no way of getting into melee without her making the first move, and there was nothing on the flank he could be confident would survive her charge. With Steam Cloud shutting down his mediocre ranged options he was basically forced to abandon the flank without challenge. Out wide and played well Miss Step should be near untouchable, unless your opponent wants to over commit to dealing with her, in which case basic evasion should make this difficult and time consuming. This plays into her final strength, self reliance. Miss Step's abilities are predictable, she'll never go Rail Golem crazy and wipe an apposing crew but similarly she'll never black joker nimble or steam cloud at a critical moment. I value this reliability over a few extra points of potential power. Looking at her upgrade options there are a number that would certainly work for her but I think she does her best work naked (gigady). Adding more cost to such an expensive model with limited defense is putting a lot of eggs in an already fragile basket. So that's my two on Miss Step in short a mobile killing machine you need to handle carefully or risk losing. I hope you found that useful. I'll probably take a break from this format next week to look ahead to tournaments coming up between now and the end of the year. Thanks for reading and I'll see you all Breachside. "Of coarse no model can excel in; damage, movement and defense so our Miss Step is a delicate flower." Cut to a shot of Tuco.